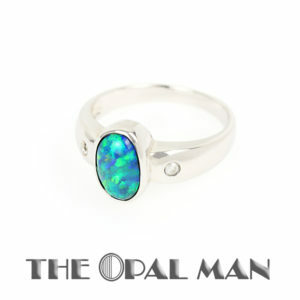 Fancy Australian boulder opal sterling silver ring with cubic zirconia accents. 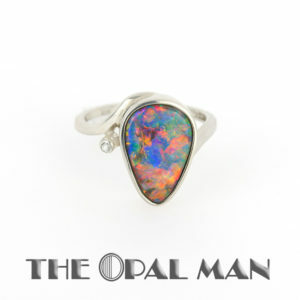 The boulder matrix in the opal is really unique because of its white coloring intermixed with the dark brown coloring. Blue/green waves can be seen flashing across the surface in the larger region of the opal, while slight orange colors flash near the tip. Ring size: 8.5 — Please call with questions about ring resizing.